Stunning, uninterrupted views of Golden Cap and the sea, and only a two minute walk to the beach through the secluded garden. Our position, on a quiet, no-through road, offers you total peace and privacy throughout your stay. 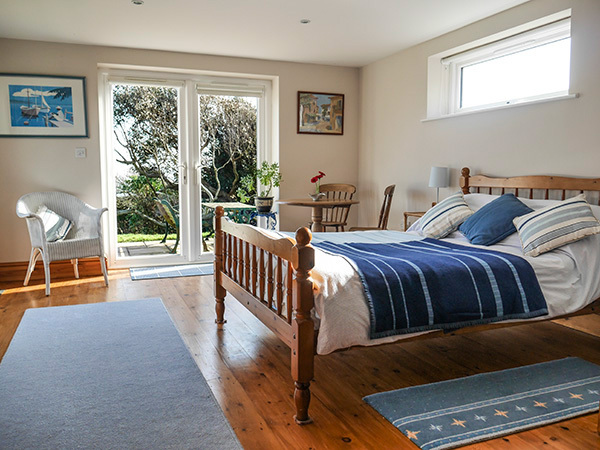 The guest accommodation comprises of a spacious, light-filled room with a double bed and en-suite bathroom and a well-equipped kitchenette including a kettle, toaster and fridge. Sky tv and wi-fi are available. A delicious continental breakfast of cereals, fresh local bread, yogurts, juice, homemade preserves , fresh fruit and organic teas and coffee is included in the price of £90 per night. It is only a ten minute walk to the village with its many amenities, including shops, restaurants, pubs and cafes.